Lauretta Howard battles W.P. 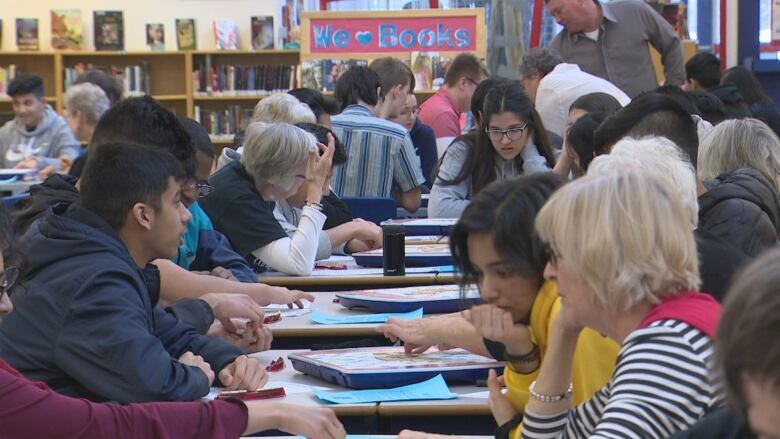 Wagner High School students Wednesday as 25 grandmas and 90 students in Grades 10-12 played Scrabble during Power of Words 2019, an intergenerational fundraiser for Grandmothers of Alberta for a New Generation. Please click on this link to read an update on the impact of Cyclone Idai and the response of grassroots organizations. From Dawn Gibbs: “Here is a photo of the girls we taught to make an apron in 1 and a half hours!!! Thanks so much for the fabric – it was perfect for this project. The girls were able to complete it and were very proud of their work!!! 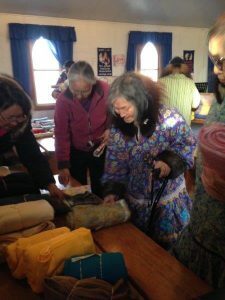 We hope to connect with you again for more fabric to teach more women- such a rewarding experience for us all! 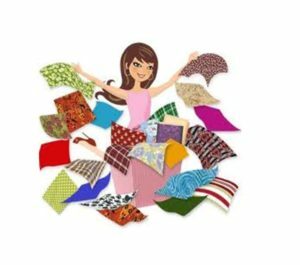 If you are cleaning out your sewing or craft cupboard, we are actively seeking donations of fabric, wool and notions for our Fabulous Fabric Frenzy May 4 at Hardisty School. Donations may be dropped off any Thursday, 10 am to 2 pm at Strathearn United Church, or send us a message and we will come and pick up! Wow, what an event! A very large thank you to all of you who volunteered and those who came to shop. We started the day with more than 350 works of ‘art’ and sold about 200 of them. A special thanks to the GANG Publicity Team for doing an outstanding job of sharing the message of the event and to the GANG Hospitality Team who looked after coffee, punch and lovely bags of goodies. All in all another example of working together to create success. We raised about $5,000 to support the Grandmothers Campaign. Special thanks to our friends Dawn Harrison and Marlene Bidgood – they helped to create a spectacular display of all of our items, and were a big part of our success. Due to construction on 95 Avenue, the GANG fabric sale date and location has changed this year. New location: Hardisty School, 10534 62 Street, Edmonton. Lots of free parking. New date: May 4th 2019, 9.00 a.m.-3.30 p.m., admission $2. We apologize for any inconvenience this may cause our loyal clients and look forward to seeing you there. 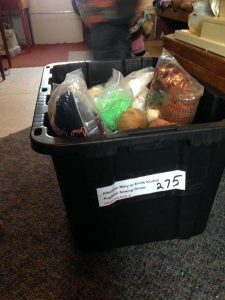 We will continue to accept donations of fabric, yarn and notions at Strathearn United Church (8510 95th Avenue) every Thursday, up to and including April 18th, from 10:00 am -2.00 pm. For inquiries regarding donating at other times, please contact Judy 780-434-0036, Phyllis 780-469-6327, Ev 780-434-0825, or in St Albert, Kate at 780 -902-1894. We would also like to encourage everyone to support our partners, Strathearn United Church at their Rummage Sale on April 13th, to be held at the church. We look forward to seeing you at Hardisty School, May 4 for the Fabric Frenzy! We are excited about our latest venture, coming this Saturday, March 9, Southminster-Steinhauer United Church, 10 am to 4 pm. Admission $2. We have lots of art and home decor items for purchase, at great prices. Plus, we have local artist Shauna Madsen creating an original work of art on site, which will be available for purchase. You can see some of Shauna’s artwork here: www.foreverinart.com. A gang of grandmas played Scrabble with Edmonton high school students for a good cause. 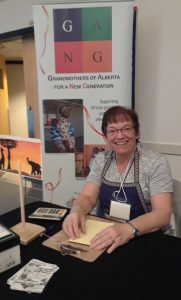 The Grandmothers of Alberta for a new Generation (GANG) organized a Scrabble tournament at W.P. Wagner High School to raise money, along with other non-profits across the world, for grandmothers in Africa who have to deal with the fallout from the AIDS epidemic and take care of orphaned children. 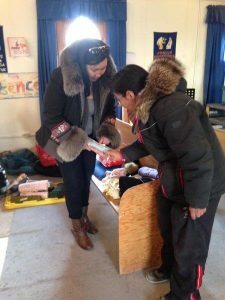 “Many of us could not imagine what it would be like in our 50s, 60s and 70s to then be parents again,” Judy Dube, a GANG member, told CTV News. The fundraiser at a high school also allows these grandmothers to educate a younger generation about their cause. 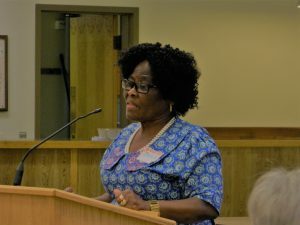 “We’ve been in and talked with classes, shared the grandmother’s story, why we’re involved and how it fits with their curriculum in social studies here and their whole sense of global social justice,” Dube said. For more information about GANG and what they do, click here. Click on the link to watch a video of the GANG’s Scrabble Fundraiser with W. P. Wagner students on February 20, 2019. Shop for the unexpected at our first Art and Design Market, March 9 from 10 am to 4 pm, Southminster-Steinhauer United Church, 10740-19 Avenue, Edmonton. Donate Aeroplan miles this week! DOUBLE YOUR IMPACT! From Feb 11-17, Aeroplan will match Miles donated to the SLF, up to 500,000! Aeroplan Mile Matching Week is HERE, and it’s such a special opportunity to make your Miles most meaningful! The current LRT construction work being done on 95th Avenue makes it impossible to turn north onto 86th Street to reach the church back door. But we are definitely there at the posted times and grateful for material being delivered. C) when travelling south on 85th St from the 98th Av traffic circle, take the immediate first right onto Strathearn Drive entrance, then first left onto 87th Street and proceed south to the church. Please feel free to contact the numbers listed for further information. We will post updates if and when necessary. Have you looked in Grandmother’s Cupboard? 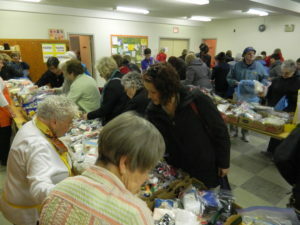 March, 2019 marks the two year anniversary of Grandmother’s Cupboard, a co-operative venture between GANG and the Old Strathcona Antique Mall. During that time we have found new homes for a range of well loved family treasures: a child’s sled. A foot stool covered in needle point. A hand carved wooden troll from Norway. Tea sets and tea wagons. An RCA radio in a walnut case. Embroidered linens from Hungary. Depression glass. Wedge wood. Lustre ware. We’ve sold scarves, costume jewelry, leather gloves, pearl buttons, wooden spools. Even a box of nylon stockings with seams. We’ve relied heavily on Betty Reitan, owner of the Mall and herself a GANG member, as well as those on her staff as we’ve learned how to select, price and display these items, each of which has a story of its own. We may never know what that story is: who bought the stockings and saved them to wear for a special occasion that never came. What programs the owners of the radio listened to as they gathered around it with their family. The name of the child who raced down snowy winter hills on her sled. Their mystery is part of the attraction of the items we sell. We have also relied on the generosity of our members in donating items or referring us to possible donors. Many thanks to them. If you have something you think would fit our eclectic collection, please contact Colleen Kennedy, colkennedy@shaw.ca or Dianne Linden, diannemlinden@gmail.com. In the meantime we invite you to drop by the Mall, 10323 78 Avenue in Edmonton and view our current collection. There may be something there for you. In this video, Stephen tells us he is feeling well and is cancer free! A very optimistic start to 2019. We are excited to announce our newest venture…an Art and Design market, to be held March 9, 2019. We are looking for donations of art and home decor items such as pottery, candle holders, vases, and ornaments. If you have items to donate you can bring them to Redeemer Lutheran Church every Tuesday in January beginning January 8. Redeemer Lutheran Church is at 9654-74 Avenue. GANG members and volunteers will be at the church from 10 am to 2 pm. 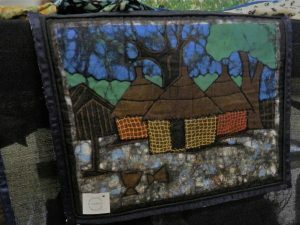 Donations are coming in for the Art and Design Market. 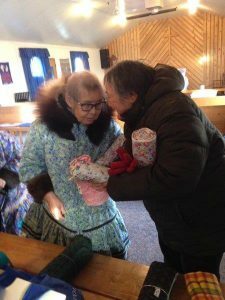 This fall grandmothers organized flash mobs in communities across Canada to raise awareness about the scale of the global AIDS pandemic, and the herculean role African grandmothers are playing in the response. The Grandmothers Flash Mob compilation video was released to mark World AIDS Day which is commemorated on December 1st . 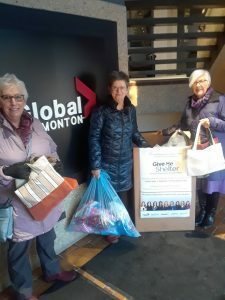 GANG members donated handmade items to Global TV’s Give Me Shelter project this week. All donations are shared with women’s shelters. Thanks Global TV Edmonton for your community support! Have you visited Grandmother’s Cupboard? You’ll find it at the Old Strathcona Antique Mall. Visit to discover what’s new in the Cupboard! Thanks to everyone who has donated new, unused fabrics and notions for our next sale. If you have items to donate, please contact Phyllis (780)469-6327, Judy (780)434-0036 or Ev (780)434-0825 to make arrangements for drop offs and pick ups. We value our partnership with Strathearn United Church; please do not leave donations at the church, except with one of our members. Please share this information with any and all of your friends and acquaintances who may be downsizing or clearing out their house. 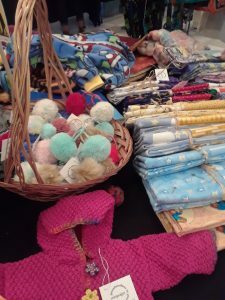 Fabric Frenzy 2019 will be held on Saturday, April 27, 2019. More details will be posted closer to the date. Working together we achieve a number of objectives: raising funds for a worthy cause, recycling, keeping things out of the landfill, and providing fabric at reasonable cost to sewers and crafters. Effective Thursday, January 3, 2019, the GANG will be holding weekly folding sessions of donated fabric from 10:00 am – 2:00 pm at Strathearn United Church, 8510-95 Avenue. Donations will be accepted on Thursdays, 10:00 am to 2:00 pm from January 3 until April 11, 2019. Please bring donations to the alley door and ring the buzzer. To make sure we can use your donation, please check that it fits with the list below. Sewing notions, zippers, hooks, buttons etc. Shakers and Makers Market a success! Thank you to all of the volunteers, Southminster-Steinhauer United Church, Global Edmonton, and of course to all of the shoppers who helped to make the day a success. 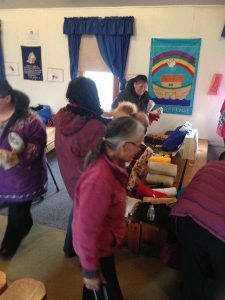 Wonderful crafts, art work, fantastic baking and delicious snacks and lunch! On Thursday September 27, 12 GANG members went to W. P. Wagner High School to play Scrabble with high school students from across Canada who were in Edmonton to attend a leadership conference. To quote one of the participants: “It was a wonderful heart-warming afternoon playing Scrabble with energetic and enthusiastic groups of young people”. Thank you to Vicki Strang and Ricki Romito for organizing this event, and to the other 10 members who attended. The next day Vicki and Ricki also went to McNally High School and gave 4 presentations on The GANG to students there. A very busy week for them both. Grandmothers Gathering a great success! Saturday, September 29 was a great day of connecting, learning, eating, laughing and shopping. Over 70 of us gathered to attend a variety of sessions. There were grandmothers/others from Eastside Grannies, Grateful Grannies, Hands Across the Sea, Rayanna’s Hope for Africa, Ujamaa Grandmas, and of course The GANG. 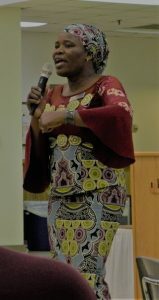 The day began with a talk by Zodwa Ndlovu, an African grandmother who lost both of her children to AIDS and is herself HIV positive. Zodwa founded Siyaphambili HIV and AIDS Support group. Her talk was both heart wrenching and hopeful. There were a number of sessions offered throughout the day and then the conference closed with a keynote by the journalist Paula Simons talking about The Power of Stories. Paula began by telling us about her two grandmothers who were immigrants to this country. Her talk was both serious and funny and was a great way to end such an enlightening day. A big thank you to Eastside Grannies, Rayanna’s Hope, and to those members from The GANG (Wendy Legaarden, Joyce Madsen, Susan Bell, Lois Gluck) who organized the day. And also to the Grateful Grannies who supplied all the snacks. This day reaffirmed our resolve to work on as we stand in solidarity with our African sisters. This might be of interest to you….. The sea can from St Albert arrived in Ulukhaktok a couple weeks ago. 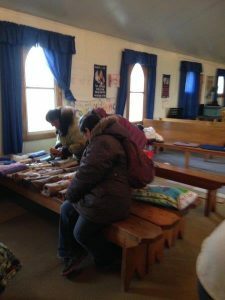 Following is a message from Emily Kudlak who is the SSVP North of 60 contact for the Anglican Women’s Auxiliary in Ulukhaktok. 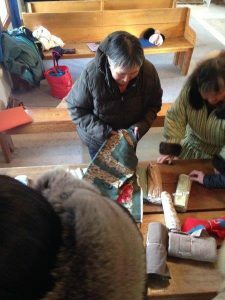 She thanked us for the fabric and yarn that arrived on the sea barge, in an email and by a facebook post with the attached photos. 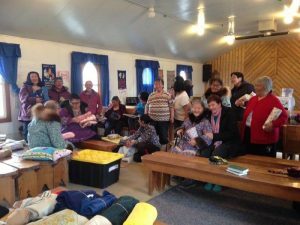 Thank-you to the Grannies for Africa, Stephen Lewis Foundation for supporting the North of 60 Project and donating a lot of fabric and yarn to the seven N of 60 communities. There is no doubt that many beautiful items will soon be sewn with the donation. 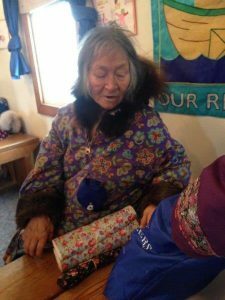 Note, the gorgeous parkas that are sewn in the hamlet of Ulukhaktok. The Shakers and Makers Market sneak preview! 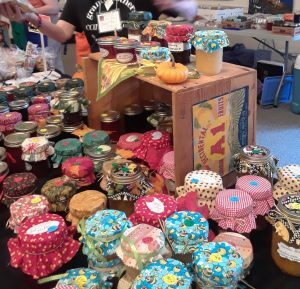 Members and friends of The GANG have been busy creating handmade items for our first Market, Saturday October 20 at Southminster-Steinhauer United Church, 10740-19 Avenue, Edmonton. Here are just a few of the items that will be available. We hope to see you there. All proceeds benefit the Grandmothers to Grandmothers Campaign. Mark the date for Fabric Frenzy 2019! It’s official – our next Fabulous Fabric Frenzy will be held on April 27, 2019. Watch this space for more details closer to the event. Our first ever Shakers and Makers Market coming this fall!